Images are compact carriers of meaning. They have the ability to communicate volumes of information with a glance and, at times, provide hours of fruitful meditation with just a little informed reflection. Signs and symbols are a tool to bridge the learning gap which, during various parts of history, was important –the prince and pauper are suddenly both able to learn regardless of education. Artists over the centuries have used many symbols and images to communicate and teach us about our faith. Many of these great masters have used natural symbols, illustrations from Sacred Scripture, and, at times, they have redeemed and Christianized ancient mythological symbols. Since it is May, I thought we could consider three fruit (actually two and a nut) used in art to symbolize our Lady and some of her attributes. Take the pomegranate. We may remember our Classic Greek and its connection with Persephone and Hades (Since she ate six seeds, Persephone live in the Underworld for six months, fall and winter, and then above ground for six months, spring and summer). This image of fruitfulness was redeemed most notably by Sandro Botticelli (Madonna of the Pomegranate, c. 1497) and Leonardo da Vinci (Madonna and Child with a Pomegranate, c. 1475/1480). Traditionally in Christian art, it continues to be a symbol for both the Church and the Blessed Virgin Mary expressing her fruitfulness and unity with the Will of God because of the close-knit structure of the fruit. Then there is the pear which was “rarely used except in paintings of the Renaissance and Baroque periods”. It symbolizes the fruit of her womb. Typically, it is combined with other fruit and flowers in images of Our Lady. Albrecht Dürer, in his Madonna of the Pear, c. 1512, was an exception when he painted Our Lord holding a slice of pear in his infant hands. We also cannot forget the almond which in art symbolizes divine favor while also suggesting the protection of valuables by virtue of its strong shell. In Judaism, almond blossoms were the model for the cups on the Menorah. Sacred Scripture seems to prefigure Our Lady in Numbers 17: 1-8 and thus attached this symbol to her in art. 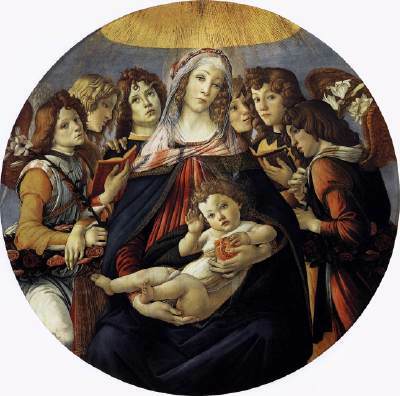 For a number of centuries, the almond shape itself appeared in artwork as the halo or nimbus around the head of Virgin Mary, as in Raphael’s Virgin and Child also known as the Bridgewater Madonna. You might also consider the image of Our Lady of Guadalupe with the almond shape Mandorla that surrounds her completely. Summertime always seems to offer families the most excellent excuse to go on vacation and visit museums. Perhaps this summer, you could visit the National Gallery of Art (For those in the D.C. Metropolitan area) and see if you can spot the various symbols for Our Lady in the Christian artwork. I provided you with three examples of fruits but there are many more – especially if you start considering flowers. Looking for more resources? Check out the following websites: Signs and Symbols and Fish Eaters – Christian Symbols. This entry was posted in Deacon Marques Silva and tagged Blessed Virgin Mary, BVM, Catholic art, Catholic culture, Catholic patronage of the arts, faith, fruit, Mary Our Mother, Our Lady, symbolism, symbols. Bookmark the permalink.